On Monday the BFS Girls JV Volleyball Team defeated Berkeley Carroll 2-0 (25-18, 25-10) in the upper gym. This match was more competitive than our first one, allowing the team a chance to work on skill building, court coverage, and teamwork. Our three 9th grade setters, Joy F., Nia L., and Juliet R-L are doing an excellent job learning their position. Everyone contributed to the team victory Blue Pride! The BFS Girls Varsity Volleyball Team defeated Berkeley Carroll 3-1 (25-21, 25-23, 17,-25, 25-14) on the road. Today, the team was challenged by a great, competitive team in BC. The team pushed hard, stayed focused, and determined, to outlast BC in 4 sets, and pick up the victory. Our team served very consistently and worked hard in transition from start to finish. The girls keep improving and understanding what it takes to compete at the varsity level. As the players get more comfortable on the court, learning their roles, the system will continue getting easier to execute. We look forward to continue improving in our next match. On Tuesday the BFS Girls JV Volleyball Team defeated LREI 2-0 (25-12, 25-13) in the upper gym. The team faced its most skilled competitor to date and was forced to play with focus and determination in order to secure the victory. All the players served with consistency. Silvely A., Hildi G., Nia L., and Anna L. showed 100% accuracy in their serving. The team is at the initial stages of understanding how to play three-touch volleyball, but they are already showing that they understand what it means to support one another. Blue Pride! 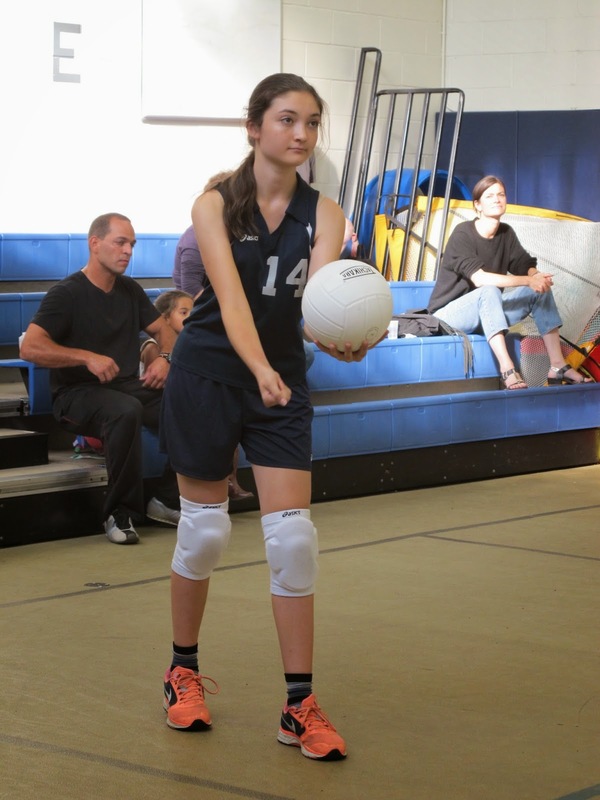 On Wednesday the BFS MS Girls Volleyball Team defeated Birch Wathen Lenox 2-1 (26-28, 25-16, 15-12) in the upper gym. The past few days leading up to the first game were nerve wrecking, some fears were tamed when we watched the Varsity team play at St. Francis Collage earlier in the week. The 8th grade girls did a wonderful job demonstrating how to stay composed throughout a nail biting match. We were matched up well with our opponent BWL, they had some pretty good servers as did we. Milla S., Maxine S., Grace F., and Galen J. had a strong presence on the court and kept the game exciting. The first set was full of suspense with an ending of 28-26 in BWL’s favor but with the help of Salma M.’s serving and the team working together we won the next set 25-16. In the third and deciding set Grace helped put us in the lead for good with six powerful serves leading us to a 15-12 victory. BFS wins its home opener. Blue Pride!! The BFS MS Boys Soccer Team defeated Browning 3-2 down at Red Hook. Today the BFS middle school soccer team got their season off to a winning start. The early signs looked promising, with Miles B. and Jack B. linking up well to create some early chances. The BFS pressure paid off after 12 minutes when Gabriel D. intercepted a stray pass in the midfield and ran half the field before firing high into the roof of the net to give BFS the 1-0 lead. The team was were under pressure for long spells in the first half, and within a few minutes of the opening goal, Browning scored a deserved equalizer. The goal provoked a positive reaction from BFS, and they restored their lead in the 20th minute after Miles B. closed down the goalie, stole the ball and finished calmly to make the score 2-1 at the half. In the second half, BFS started brightly and extended their lead to 3-1 through Coby W in the 33rd minute. Again, he capitalized on a stray pass from the goalie and slotted the ball neatly inside the far post. Browning responded almost immediately with a breakaway goal, but BFS hung on for the exciting 3-2 season opening victory. Patrick D. in goal, and defenders Finn S. and Aja M. defended superbly to ensure the teams first win of the season, in its first game. The BFS Girls Varsity Soccer Team defeated Birch Wathen Lenox 8-0 at Red Hook. The Panthers scored another eight goals as they added their 2nd win in ISAL league play. Freshman Niamh H. started off the scoring early in the game, and more goals followed with sophomore Halima M. scoring a hat trick, and a brace from both Devon O. and junior Naya C. Panther Pride!! The BFS Girls Varsity Volleyball Team defeated Birch Wathen Lenox 3-0 (25-10, 25-6, 25-15) in the upper gym. Today the team showed great composure, focus, and determination in defeating their opponent. The team started the match very consistently, taking control of the rallies, and putting pressure on BWL with our strong serves. The team played very united. We continue improving our transition and offense, as everyone improves their understanding of the system and each members individual role. Overall, a great performance this early in the season. Blue Pride! On Friday the BFS Girls Varsity Volleyball Team defeated Garden 3-0 (25-8, 25-18, 25-3) at St. Francis College. Today’s game provided a great test of mental strength, as we played a very young and inexperienced team. We won in three straight sets, showing consistent transition and strong serving. After being very focused at the beginning of the match, the team relaxed during the second set making it challenging for us to dominate the pace of play. The was forced to take a time out, refocus, and get back to playing aggressively, to dominate the rest of the match. Overall, it was another good learning experience for our young team. Blue Pride!! The BFS Girls JV Volleyball Team defeated Birch Wathen Lenox 2-1 (25-14, 22-25, 25-16) at Basketball City. The team played its first away match of the young season. The match provided the team a wonderful learning experience, as they had to adjust to playing in a wide open space and build confidence in their sense of knowing which balls should be played versus which balls were going out, and thus should not be played. Our opponent had one strong server, and she gave us the opportunity to rise to the challenge of returning a hard hit ball. The team showed improvement in each of the three sets as they worked together to win a side out from her serve. In the third set BFS allowed this server just one point. The road trip gave the team a chance to bond before going into the weekend and next weeks games. Blue Pride! 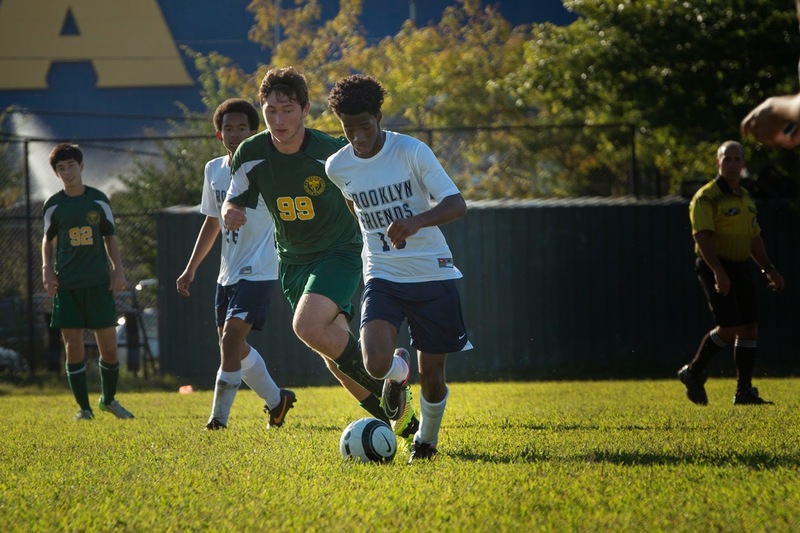 The BFS Boys Varsity Soccer Team defeated Elisabeth Irwin 1-0 down at Red Hook. The team earned their second win of the young season in a very well played game. After losing mid week to BWL, the Panthers needed to get themselves back on track. Game captain sophomore Charlie S. led the team with four shots, two of which were on target. The Panthers out shot LREI impressively 13-3 throughout the game. But it wouldn’t be until the twenty-fifth minute that the deadlock was broken. After receiving the ball from a throw-in, Charlie S. plays a quick ball over the top of the LREI back line. Before the defenders were able to react, left winger Quran D., sprints onto the pass beating the keeper to the ball and passes it into the goal. The Panthers started the second half with a 1-0 lead and continued to try to add on to their lead. Noah W. came close to opening his goal scoring account this season after coming close on multiple occasions. But the closest opportunities came from center-back Colin P. after getting his head on two Charlie S. corner-kicks and a free-kick from about thirty yards out. The game was won for the Panthers in the defensive third of the field. With center-back Isaac H. making key tackles and defensive-midfielder Henry J. putting himself into important positions to intercept passes and win high balls, there was no getting through the defensive line. Honorable Mentions: Lateef F., Omar M.
1-0 up in the 24th minute after a quick counter and good combination play. It was 2-0 six minutes later, after Halima M. latched onto a long kick from goalkeeper Julia B. and finished from the break-away. Halima M. added two more goals in the second half to complete the scoring. The win puts BFS in first place in ISAL league play with a 3-0 league record.